Who hasn’t peeked over the balustrade at a coastal lookout or over the side of a ship to get a glimpse of what’s below the surface of the ocean? We have a fascination for the sea, but for most of us the underwater world remains largely off-limits. All this is set to change as Sydney Institute of Marine Science opens its new Discovery Centre to enable everyone to explore the fascinating underwater world of Sydney Harbour and learn about its marine science via a series of exciting displays that feature novel digital and 3D technologies. The historic sandstone mine labs at the waterfront of Chowder Bay, adjacent to the Sydney Institute of Marine Science (SIMS) labs and aquarium facilities, are the perfect backdrop for the new Discovery Centre, which has been more than a year in the making. 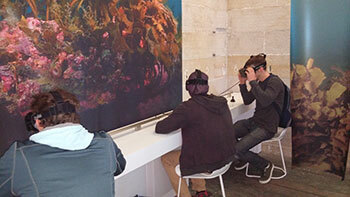 One of its highlights is the virtual dive using Oculus Rift virtual reality goggles. Specifically designed for SIMS, the dive immerses the user into the magical world of a local kelp forest, the most prominent ecosystem on our temperate rocky shores. Reactions of visitors so far have been overwhelmingly positive with comments such as “I don’t want to stop!” and “This is amazing!” It has been great to see how immersive and thought provoking this experience is for users. The Sydney Harbour room also features a 3D model that shows the complex shape and topography of the Harbour’s seafloor, overlayed with a series of LEDs that indicate the extent of its various ecosystems, A set of drawers allow visitors to discover the intertidal zone. Leaving the Harbour, a second room, leads visitors onto the open coast. Here the main themes explored are the East Australian Current, the main boundary current along the east coast of Australia, and the impacts of climate change on this current system and coastal ecosystems. Exhibits in this room tell the story of scientists and their research projects. Gorgeously designed digital displays on touch tables invite visitors to explore the stories behind the research and learn about topics such as coastal erosion, coral bleaching, toxic algal blooms and eddies to name just a few. Scientists of the NSW Department of Primary Industries shed light on some of the challenges of managing fisheries in a changing climate. An eye-catching mystery prop involves getting your hands into a dense mat of artificial algae! The Centre is currently open to the Public on the second Sunday of each month from 10am to 2pm. For group bookings please email sims@sims.org.au or call 02 9435 4600.